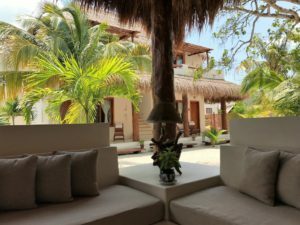 Tierra del Mar Hotel was created by Christian and Costanza, an Italian couple who fell in love with the island and decided to change their lives by building this exclusive hotel in a unique place: Holbox Island, part of the Yum Balam Natural Reserve in the Mexican Carribean Sea. With only 6 rooms, reserved to adults, the Hotel aims at offering guests a relaxing and charming space, far away from their daily lives, where they can disconnect from modern society and enjoy the beauty of the island. It is located in the centre of the small village, just one block from the beach and near all services. Guests will be fascinated with the Hotel’s elegance and accuracy focused on design: entirely built with regional materials from Yucatan Peninsula, it sets against white cement floorings and sapota’s wood, tzalam and natural stones, combining all these elements with a modern and fine touch, both in outer spaces and interiors. In the centre of the building, you will find the garden with perfect decorative tropical plants. All places in the Hotel follow the same concept: from the living room and the central palapa where you will be served breakfast, to the chill-out area around the pool. Read more information about the island and how to reach the Hotel.